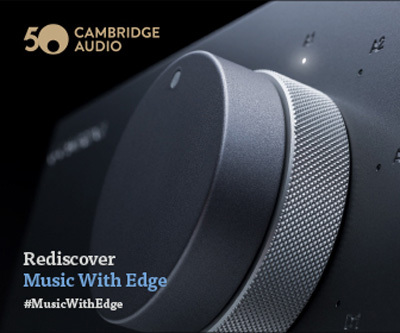 Author’s note: this post first appeared on my original soundadviceblog website, which I no longer update. It is one of my favorite posts from there and vinyl has been enjoying a real renaissance, so I have reposted it here for everyone to enjoy. The original post date was April 7, 2007 so it is almost 10 years old. It is something how fast time flies, and how quickly things can change. 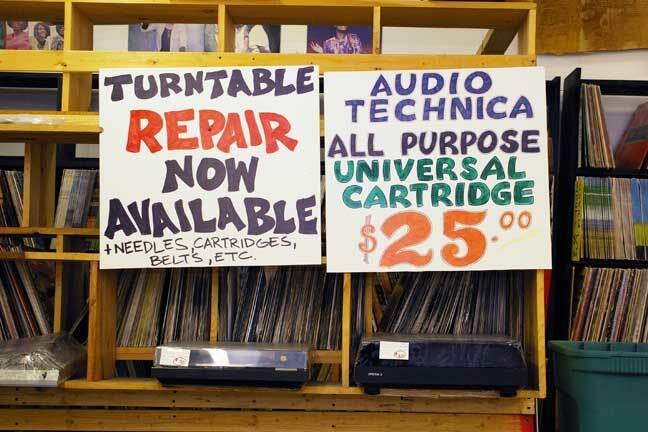 The future of vinyl was a little bit uncertain then. 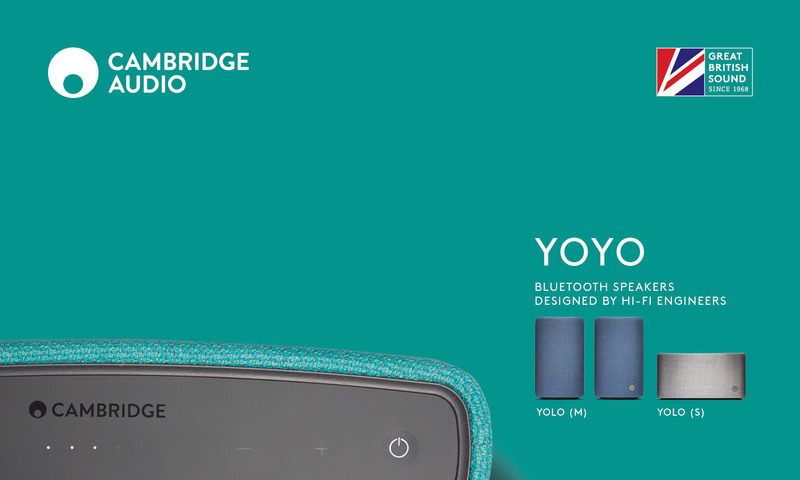 Now, it seems assured as both consumers and the industry have embraced the format again. 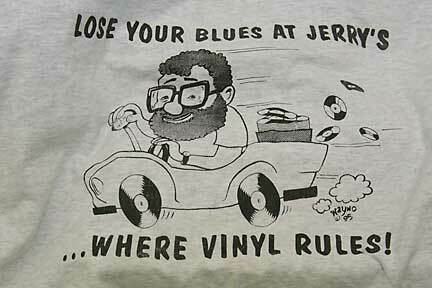 Jerry’s Records is an amazing place, and vinyl lovers from around the world will plan trips to Pittsburgh just to visit. It is worth the trip, and if you are in driving distance it is worth the trip! 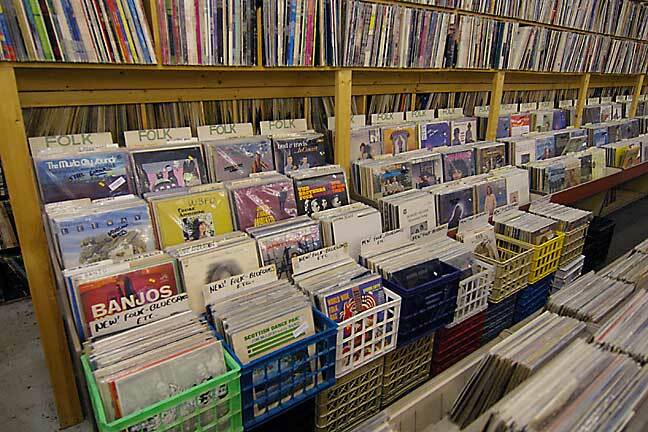 I have long been a lover of vinyl records and all they offer… sweet, rich, natural sound quality that CDs can’t match, an incredible variety of music available spanning decades (make that hundreds of years) of American and world culture, and low cost that allows one to build an amazing collection for much less than it would cost on CD. 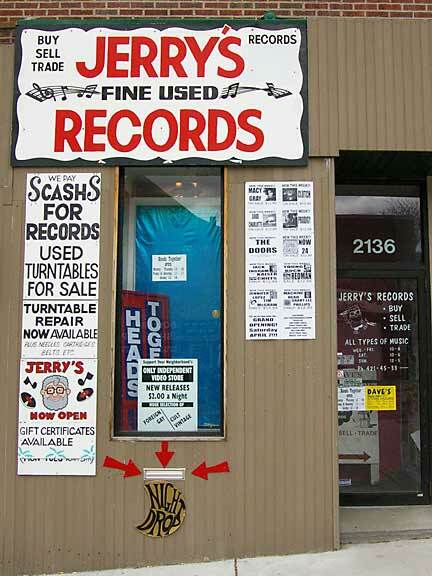 As a vinyl lover, Jerry’s Records has long been a favorite place of mine dating back to when it was called “Garbage Records” and located in the Oakland area of Pittsburgh, home of many universities such as Carnegie Mellon and The University of Pittsburgh, where I attended college myself. 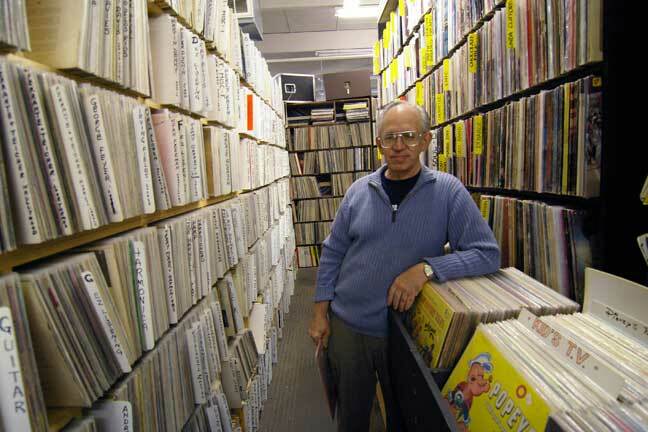 Now located in the Squirrel Hill area of Pittsburgh, Jerry’s Records is home to over a million records of all types from children’s records, classical, rock, bluegrass, and even more, as I discovered in the course of creating this feature for the Sound Advice Blog. 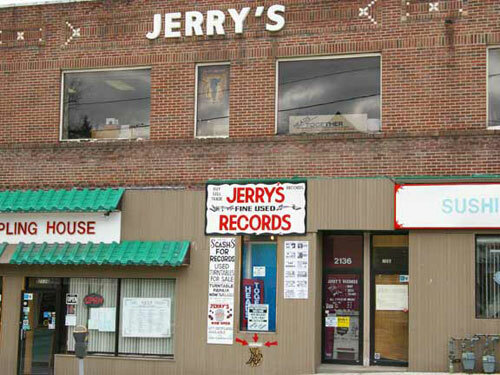 Located on Murray Avenue, one of the main streets running through Squirrel Hill, Jerry’s Records is located on the second floor of a commercial building with an interesting history, as will see later. 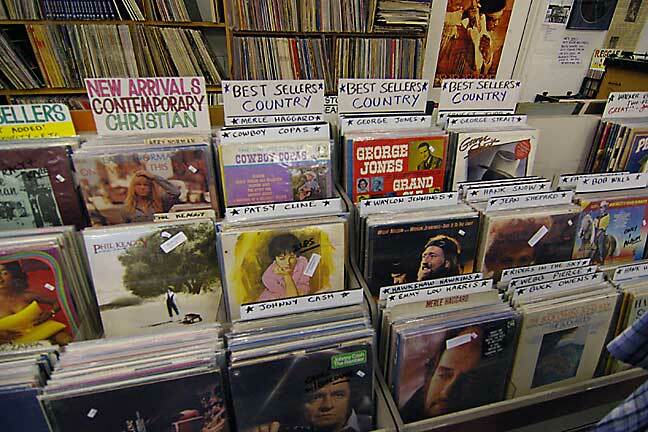 The storefront definitely shows that you are at a place owned by and frequented by music lovers. 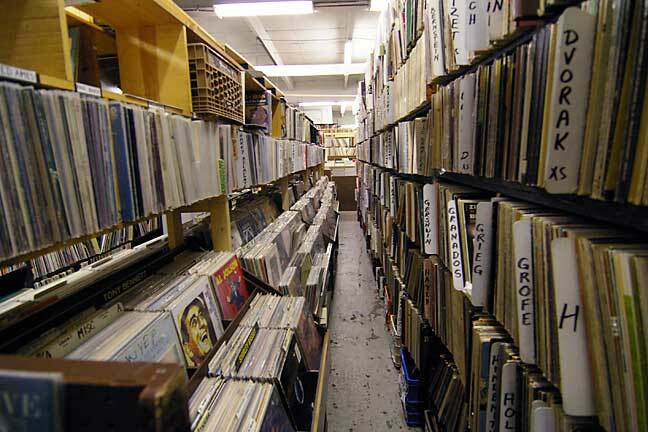 Through the door into a foyer plastered with music posters, then up the stairway… to (vinyl) Heaven! 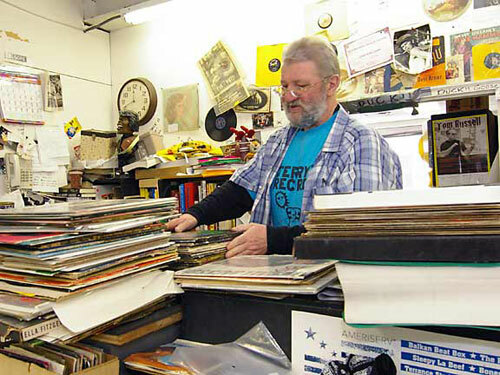 Jerry Weber is the face and personality behind Jerry’s Records, and he is as friendly, mellow, and goodnatured of a man as you are going to find anywhere. 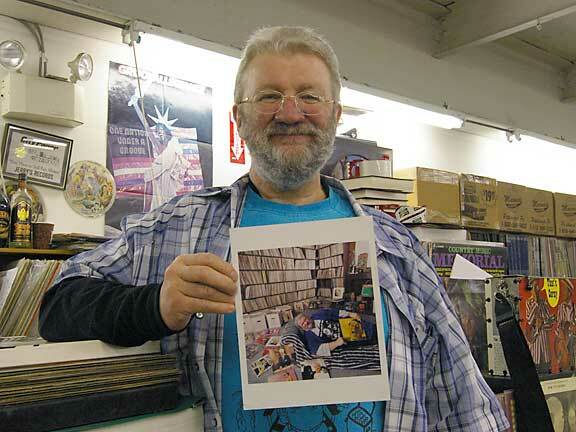 After being introduced to him once he always remembered my name and greeted me by it whenever I visited the store, and once when I offered a credit card he said, “oh, we don’t take those, just bring me the eleven bucks the next time you come to the store”. I am sure this is a priviledge only reserved for regular, known customers, but that kind of faith and trust isn’t found all that often anymore. 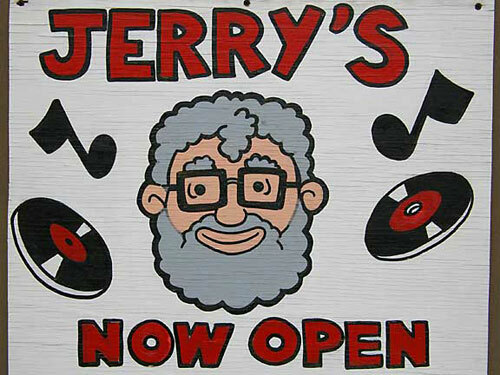 Jerry’s personality infuses the store and can be found in the fun charactitures, pictures and artwork found throughout. 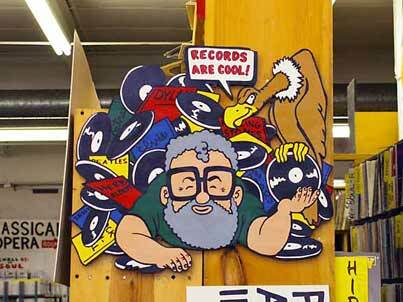 So, how did this store grow to have a million records, and what drives the man behind it? 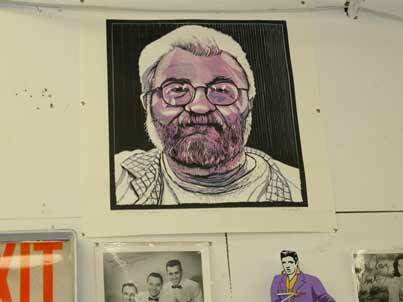 I stopped by early in the morning before the store got busy and spent some time spent with Jerry to find out. 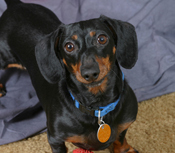 It proved enjoyable and enlightening as he told his story. 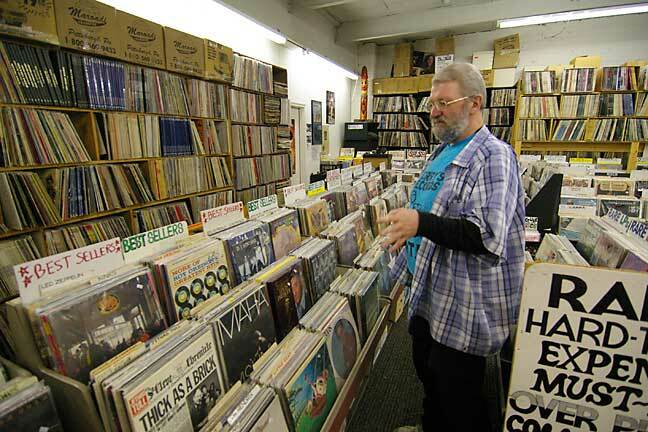 “The business started in 1976 as the Record Graveyard, in Oakland,” Jerry said. “A buddy had an empty storeroom above his bar and he said I could rent it for only $75 per month. I had a partner then, a friend named Jim Petruzzi… we were both working for the Post Office as letter carriers, and we both loved music. 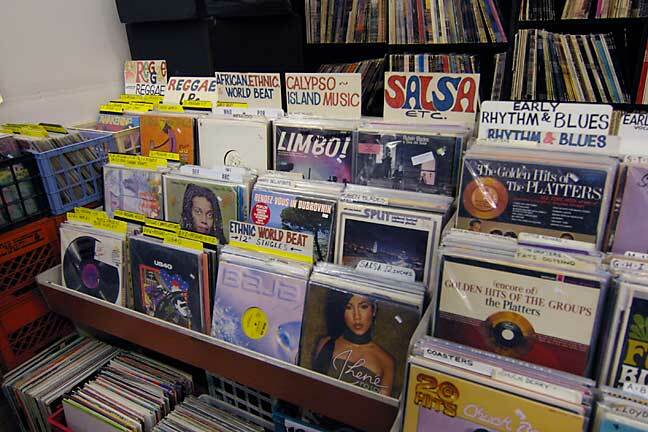 So we put a sign out front that said “We buy records”, and I threw my own personal collection of 500 records on the shelves because we needed stock. 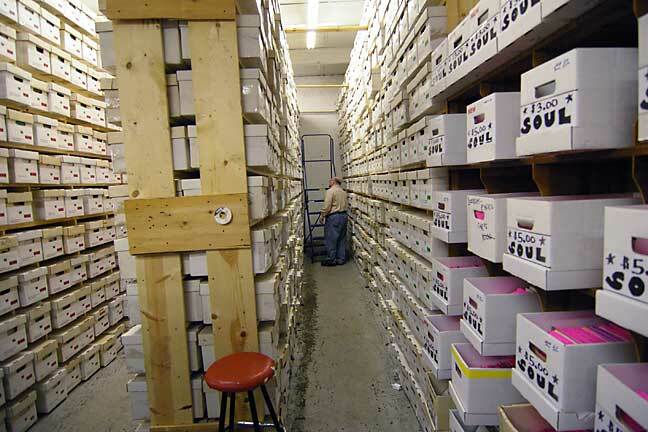 I figured I would get them back eventually, and as you can see, I was right.” I asked how many records he has in his collection now, and he replied, “my personal collection, in my home, is 30,000 records”. More on that later. 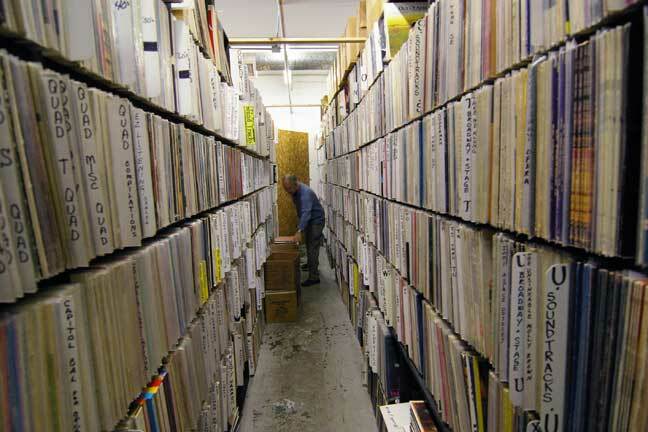 30,000 is an awful lot of records for a personal collection, which begs the question… does he ever get to listen to all of them? 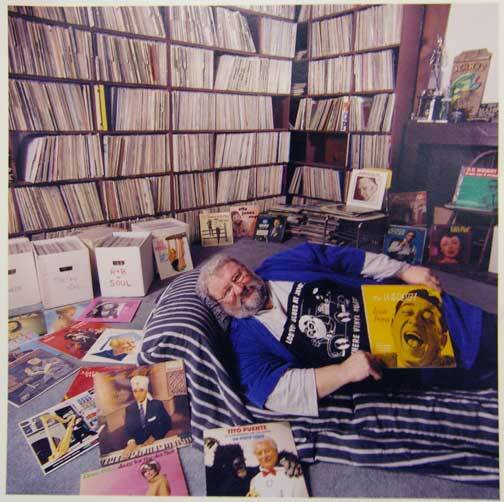 He did not answer directly, but replied, “No one should have as many records as me…but I have listened to music for 10-12 hours a day, every day of my life. 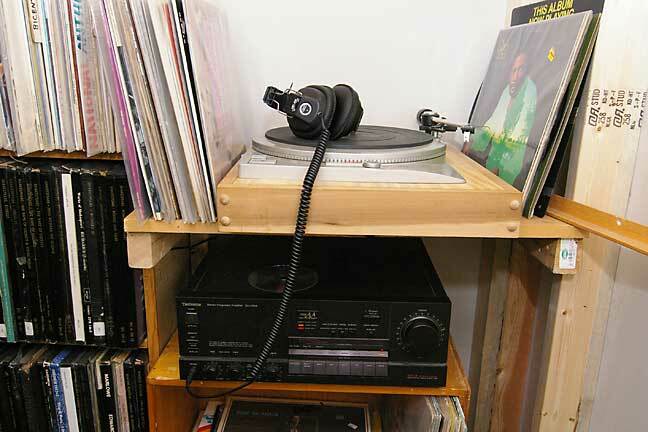 I am kind of a workaholic person, and when I am here I always have a record playing. 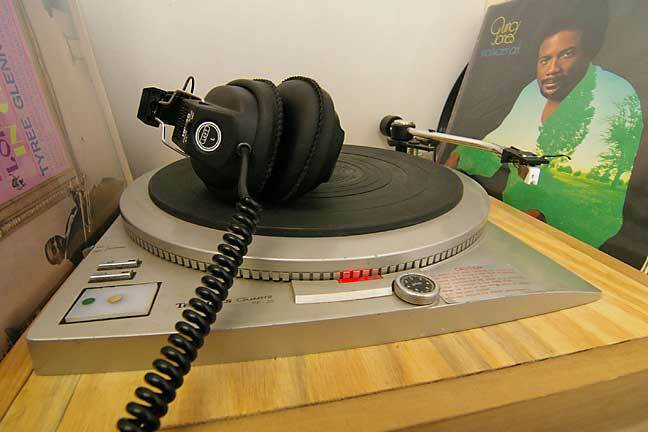 I like all types of music and I know what is good, what the good stuff is, and I listen at home, too. 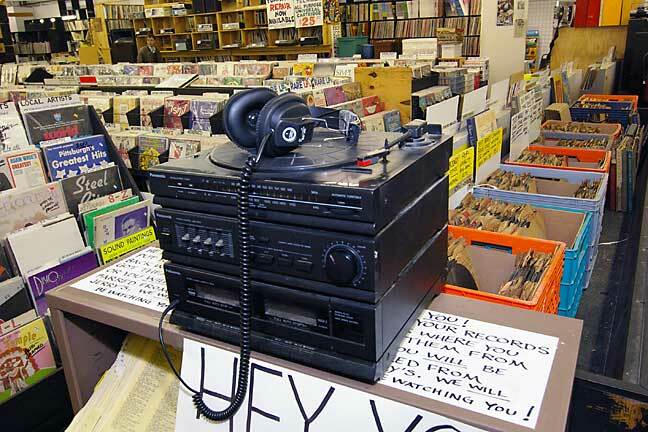 With all the records and his anti-CD mantra, it begged another question… did Jerry own a CD player? 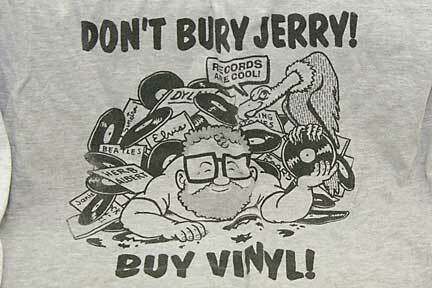 “I have one in my car, and I have a boombox that has one, but I don’t listen to many CDs.” Jerry has a series of T-shirts out promoting vinyl and sometimes dissing CD, as shown below in chronological order from his first shirt to the most recent. Finally, it was time to see the store. 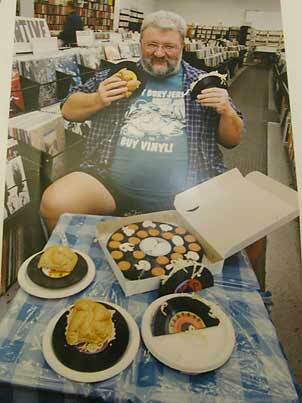 “There are a million records here, about half LPs and half 45s, very close to a 50/50 mix,” he said. 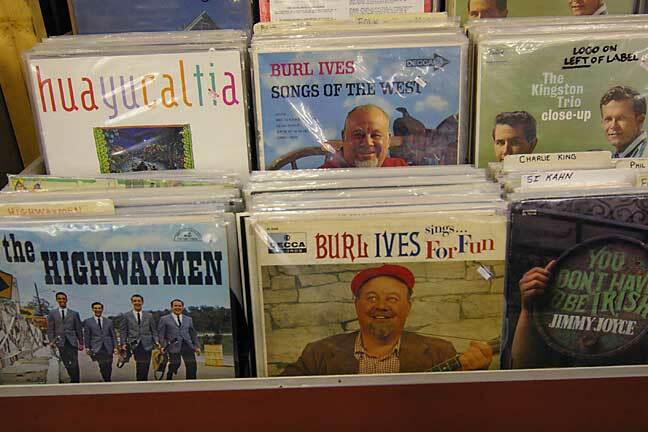 “Oh yeah, we have about 50-60 titles from Burl Ives here,” Jerry replied, motioning towards the browsers well-stocked with Burl Ives albums. LOL… why was I not surprised? 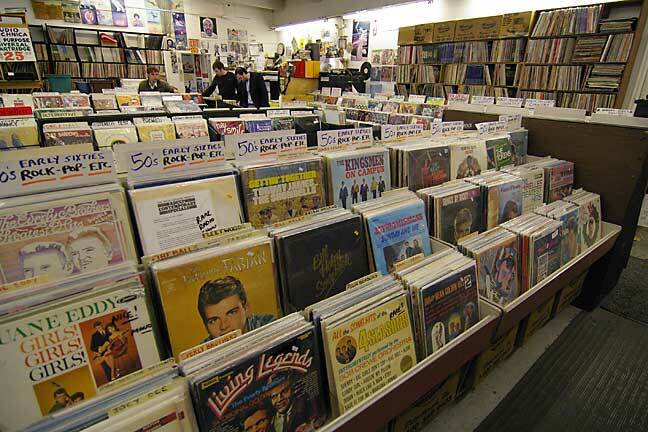 Rock and roll records take up most of the center floor area in the middle of the main part of the store. 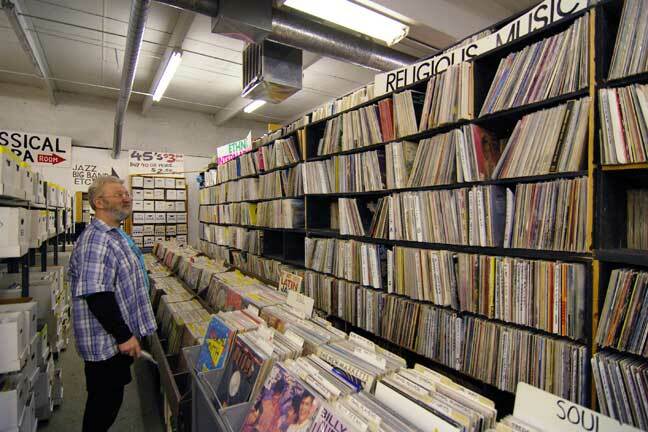 The aisle next to the wall behind the folk section is lined with vertical shelving stocked top-to-bottom with back stock of rock and roll records. 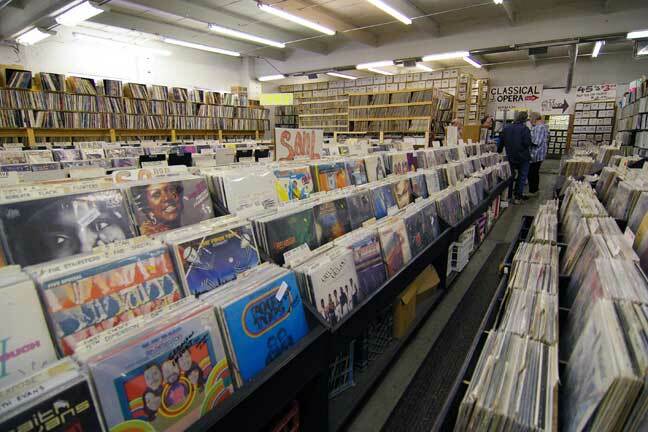 “There are about 50,000 back stock of rock and pop records back there.” Jerry said. A closer look showed anything and everything, including some names I hadn’t heard in a while… like the Captain and Tenille. 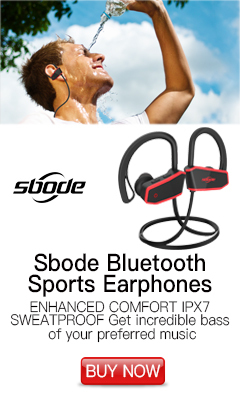 Check them out below, along with the other names! 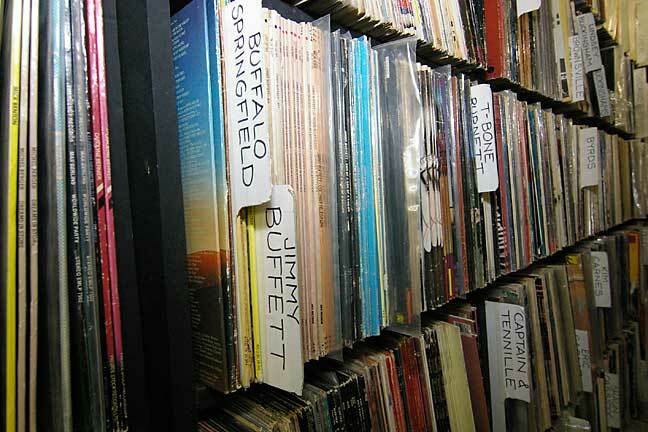 Buffet… Byrds… Captain and Tennille… Clapton…. I heard something that I had heard more than once… and would hear a few times again before the tour was over. 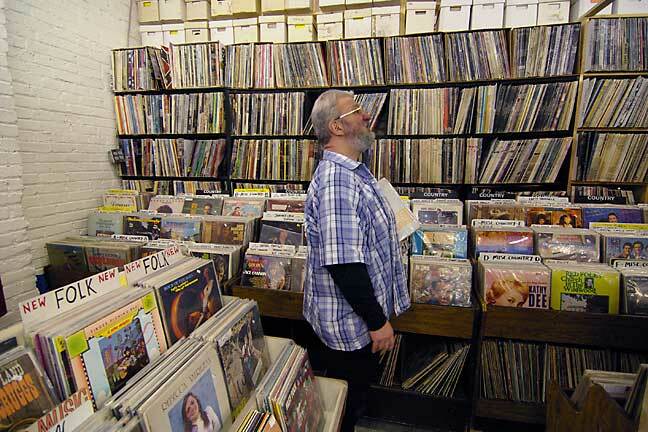 “We don’t sell many of these, but I keep them around.” Clearly this was a man dedicated to music in all its forms, to those exploring all kinds of music, and to the vinyl LP format. 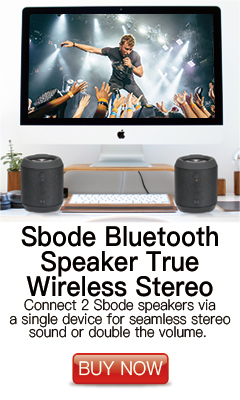 Thoughtfully provided throughout the store were listening stations, modest turntable setups with headphones for shoppers to preview their purchases. 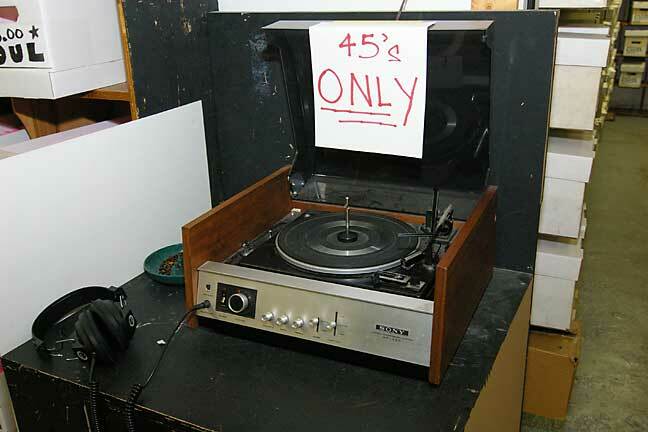 Speaking of equipment, there are used turntables available at low prices for those wanting to get started with vinyl. 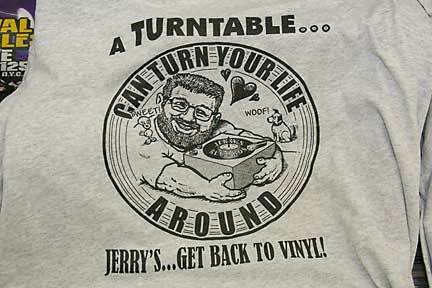 “VInce is my repairman, he fixes turntables and other equipment, and he is willing to look at stuff and give an estimate without an upfront charge,” Jerry said. 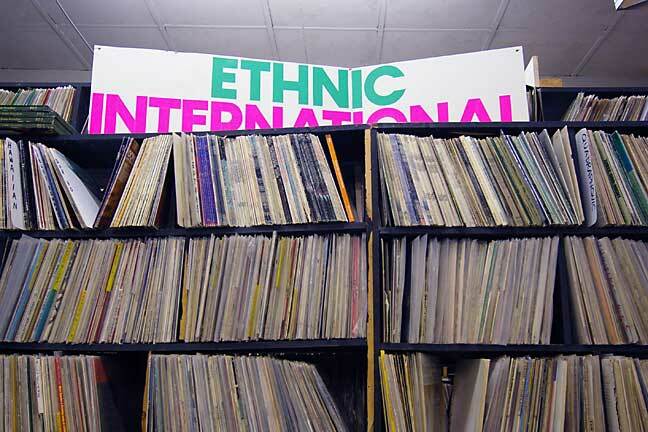 Next came the religious and ethnic/international section. 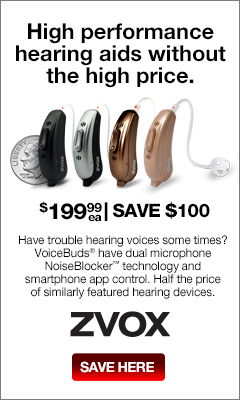 “Not a lot of sales in these, but it is here for people looking for it,” Jerry said. 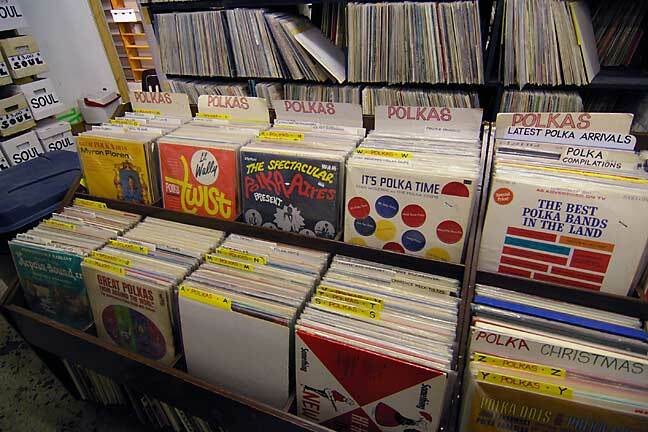 Below the Ethnic section was a bin well-stocked with Polka records. 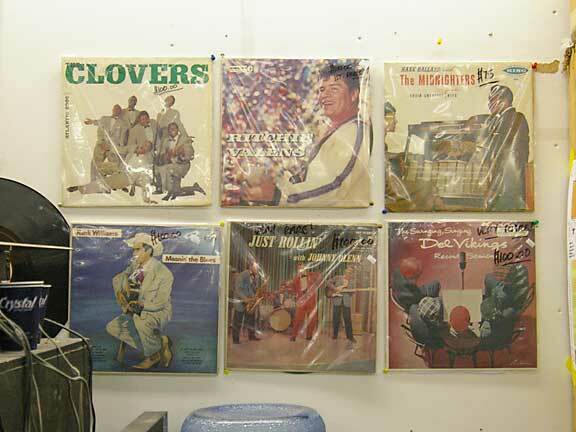 “Polkas, we do pretty well with,” Jerry said. Given the large, proud Polish-American community that has been an integral part of Pittsburgh for generations, it is hardly surprising! 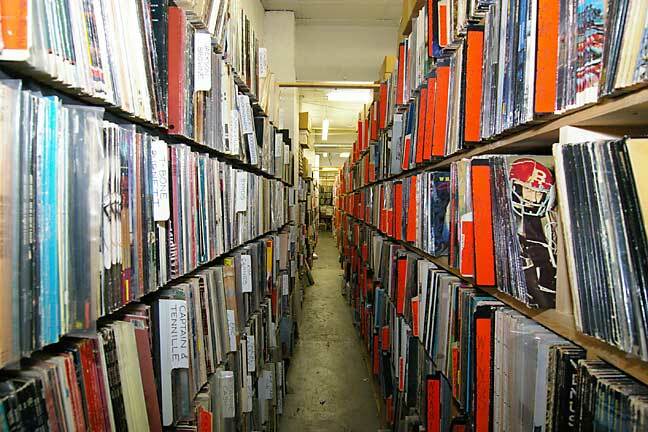 “We have the library-style rolling ladders so people can get to all of them.” I saw someone with a ladder at the end of the aisle as Jerry told me this. A very nice arrangement! 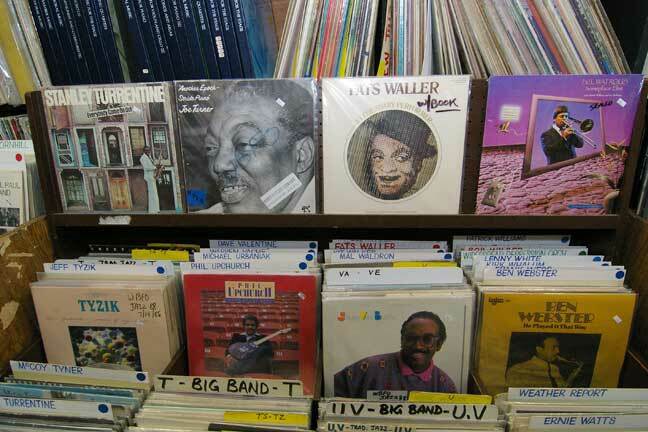 Adjacent to the classical aisle was a room filled with jazz records and additional classical stock, including some intriguing-looking box sets. 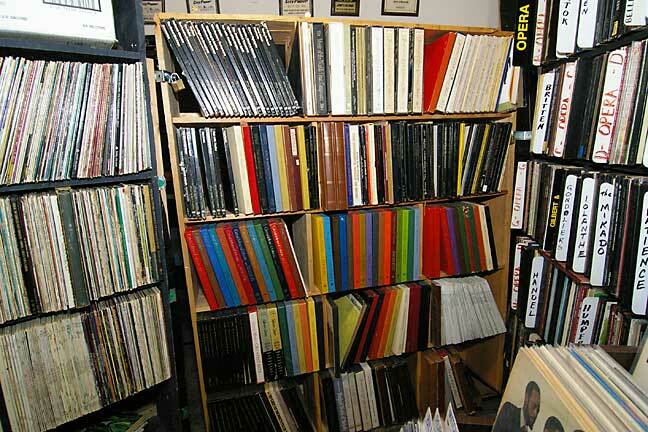 “we have one of the biggest jazz music collections you will ever find… we love jazz,” Jerry said. 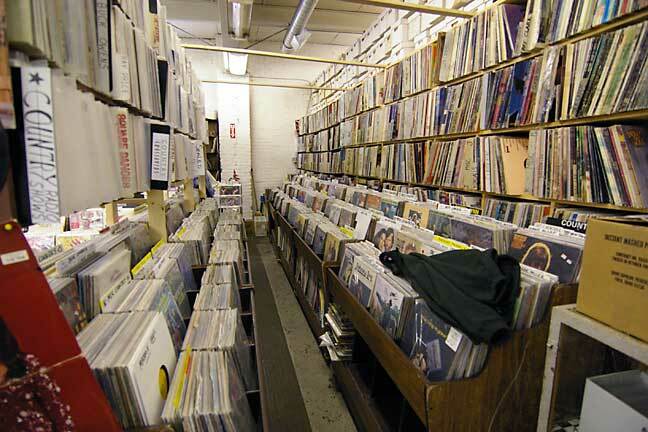 Wow, so many records… so many types- more than I expected. It was all kind of mind boggling. Yet there were still a few surprises in store. Jerry led me to a small section as we worked our way back towards the front of the store. 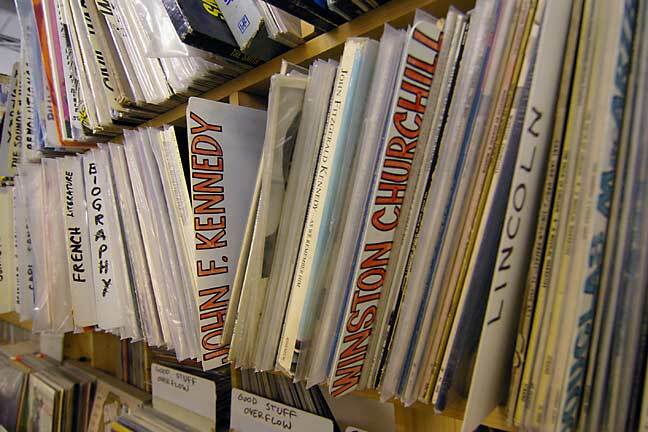 “This stuff is all the spoken word… speeches by John F. Kennedy, Winston Churchill, biographies, stories, things like that.” Who would have thought you would find JFK and Sir Winston Churchill records sitting next to each other, anywhere? 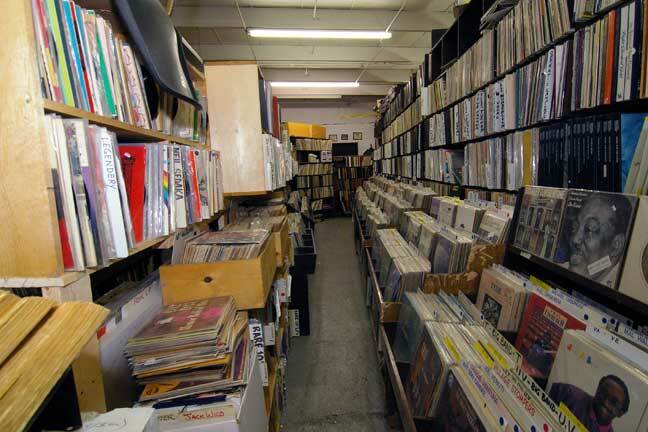 Perpendicular to the spoken word was a long aisle that ran all the way to the front of the store,loaded with soul records. 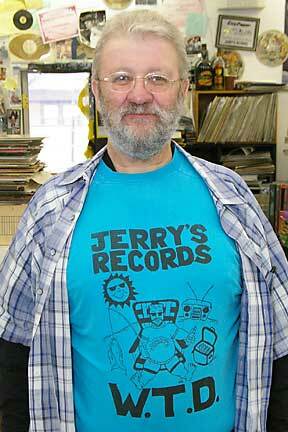 “We sell a lot of soul, it does really well for us,” Jerry said. Taking over while Jerry went back into the main part of the store to wait on customers, Fran started with the children’s records. 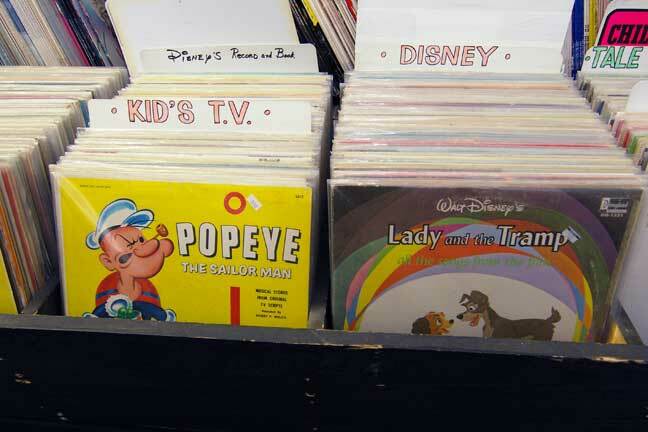 “We have an amazing variety of children’s records,” he said, showing me some examples. 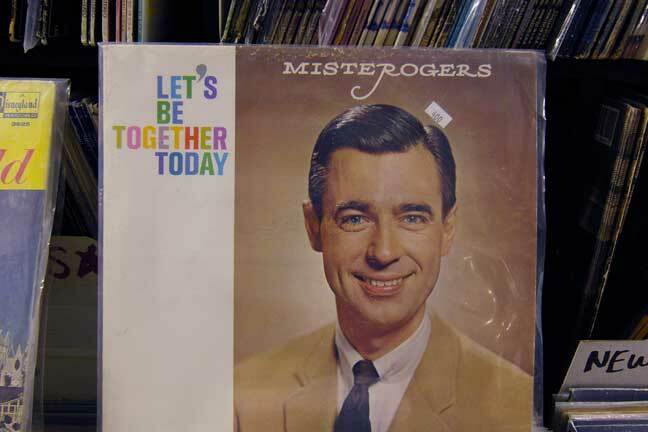 A quick look through the bins revealed several interesting and obscure titles… Romper Room, Disney’s “Small World”, and Mr. Rogers… is there ANYTHING this guy doesn’t have on vinyl? 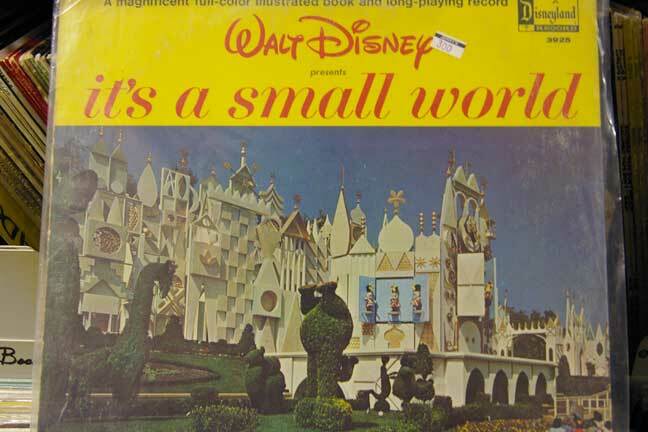 The aisle leading from the children’s aisle was filled with soundtracks and broadway shows. 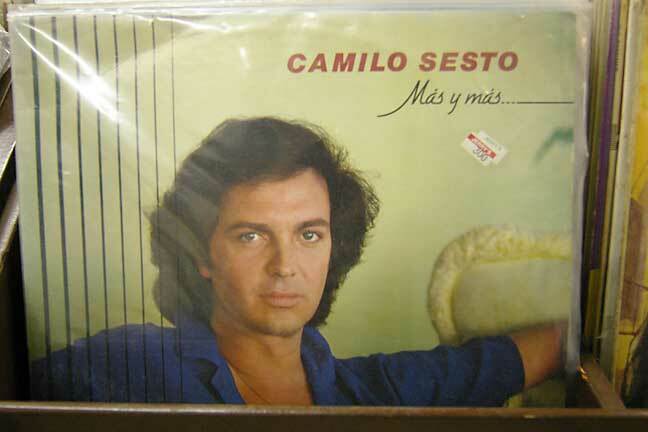 “We have a nice collection of them that have never been opened… still sealed from the factory!” Fran said. 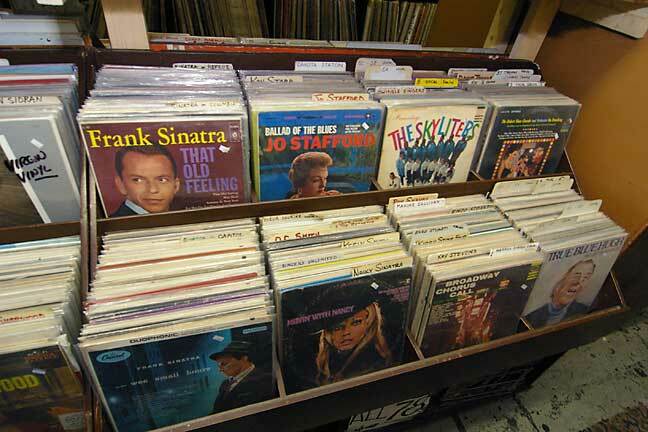 I noticed some quadraphonic records off to my right, too. Wonder who still has gear to play them? I have picked up more than a few soundtracks myself here, including such cool ones as the soundtrack to the movie “Patton” starring George C. Scott, Dr. Zhivago, and Fiddler on the Roof. 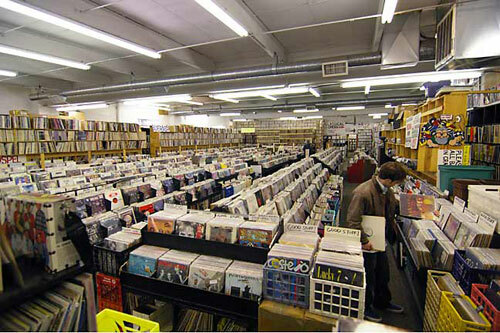 My tour completed, I thanked Jerry and headed home, blown away by the depth and breadth of his store, as well as his knowledge or music. 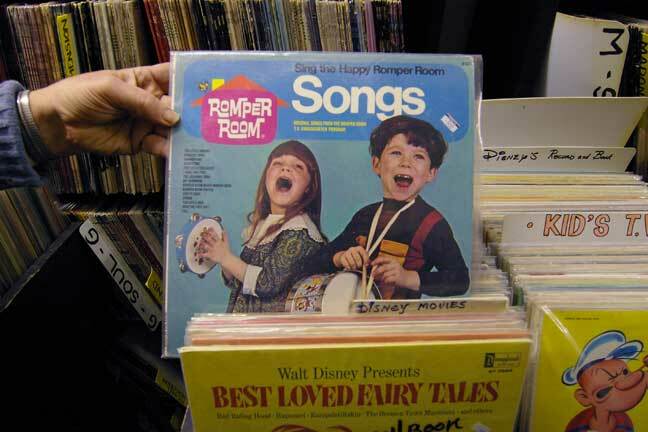 I wrote this piece and edited all the photographs while listening to records I bought from Jerry’s… the soundtrack from The Spy Who Loved Me, Memories Aux Bruxelles, the official music from the Brussels World’s Fair, Boz Scagg’s Hits! 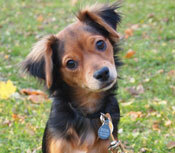 and Rush’s Exit Stage Left. Neat music, some of it hard to find, and only $14 for all four! 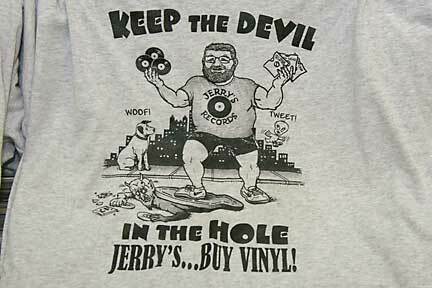 As a vinyl lover I felt lucky to live in Pittsburgh, and lucky to have someone like Jerry watching over this amazing treasure trove of music and history. 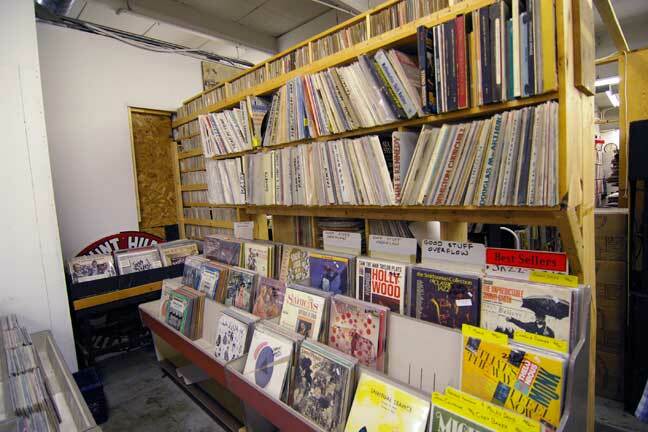 If you are a vinyl lover as I am, it is worth a pilgrimage to Pittsburgh to see this place… just bring a lot of money and a U-Haul!